New commemorative US stamps were issued for three important anniversaries during 1924 and 1925. The three commemorative stamps shown above (Sc. #614-16) were issued on May 1, 1924 to celebrate the 300th Anniversary of the Settling of the Walloons and to Honor the Huguenots. 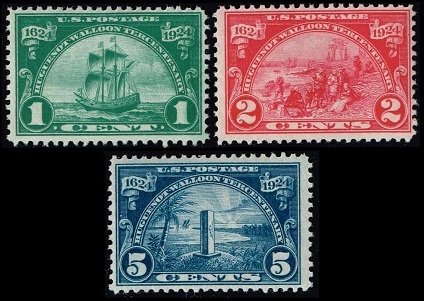 The 5 Cent denomination stamps from positions 2, 3, 4, and 5 of the UR pane from plate 15754 all have what is known as the Broken Circle Variety. They are worth only slightly more than the 5 Cent denomination stamps without the variety. The 1 Cent denomination depicts the ship "Nieu Nederland" that brought the Walloons to their new settlement in 1624. The settlement, now in the State of New York, was called "New Netherlands". The 2 Cent denomination depicts the Landing of the Walloons at Fort Orange (Albany, N.Y.). The 5 Cent denomination features a sketch of the Jan Ribault Monument in Mayport, Florida. The monument is a silent reminder of the time that France battled Spain over the colonization of Florida. In 1562, Jean Ribault (1520-1565) led an expedition of French Huguenots to Florida, and they established a colony called "Fort Caroline" in what is now Jacksonville, Florida. The French (protestant) settlers were all slaughtered by Spanish (Catholic) soldiers in 1565. The Walloons are a French-speaking people from Belgium. The Protestant Walloons fled to the Netherlands in the early 1600's to avoid religious persecution. Feeling unwelcome in the Netherlands, they petitioned the Dutch East India Company to allow them to settle in the Dutch-controlled colony of New Amsterdam (New York). Their petition was granted, and they left the Netherlands in March 1624, arriving in New Amsterdam on May 20, 1624. The three impressive-looking commemorative US stamps shown above (Sc. 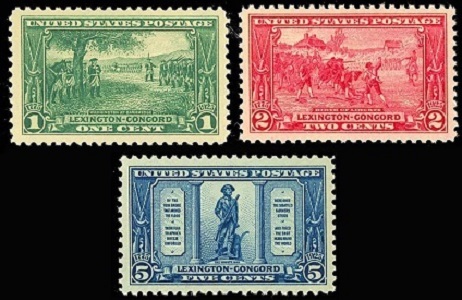 #617-19) were issued on April 4, 1925 to commemorate the 150th Anniversary of the Battle of Lexington-Concord, which launched the American Colonial struggle for independence from the British Empire. The 1 Cent denomination stamp - Washington at Cambridge - shows General George Washington taking command of the Continental Army at Cambridge. This event actually happened two months after the Battle of Lexington-Concord. The 2 Cent denomination stamp - Birth of Liberty - shows the Battle of Lexington-Concord on April 19, 1775. The design is from the 1886 painting, "Birth of Liberty", by Henry Sandham (1842-1910). The 5 Cent denomination stamp - The Minute Man - shows the famous statue, "The Minute Man", by Daniel Chester French (1850-1931). The statue was erected at Concord, Massachusetts in 1875, the 100th anniversary of the Battle of Lexington-Concord. The panels shown on the stamp, at the sides of the statue, contain the first verse of Ralph Waldo Emerson's famous poem. The two US stamps shown above (Sc. #620-21) were issued on May 18, 1925 to commemorate the Arrival of the First Immigrants from Norway on board the Sloop Restaurationen on October 9, 1825. The 2 Cent denomination shows the Sloop Restaurationen. The 5 Cent denomination shows a Viking Longship.